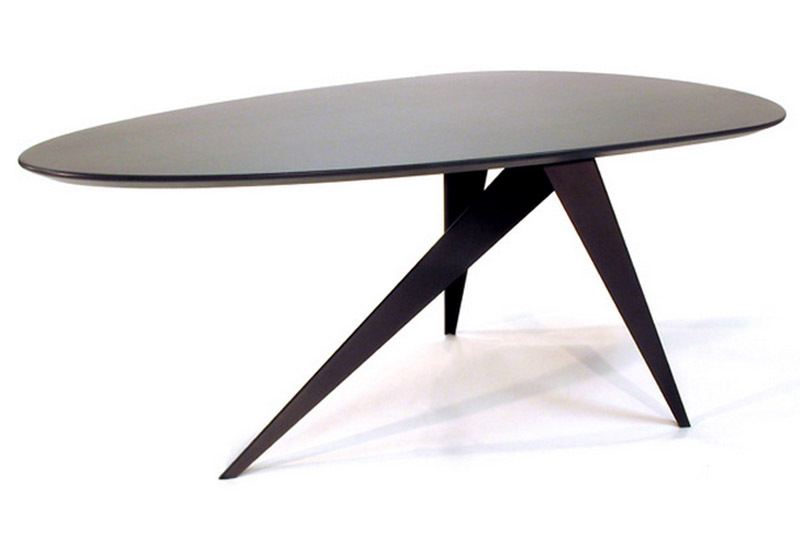 The sculptural ‘Trouvé 3-Legs’ is the first in a range of a new design called ‘Trouvé’. The ‘Trouvé’ design line will feature different legs all made of steel, finished with special matt textured coating called ‘Carbonne’. The different legs will be suited for different tabletops, round, square, rectangular, ellipse and egg shape. Different sizes are available: 175-240 length x 85-145 width x 75 height in cm. Special sizes on request. Tabletops: available solid oak, solid American walnut and in veneer versions, also in MDF in any RAL CNS colour. The tabletops can be stained in different colours. Specials on request.